The Shamwari Houseboat is based on the Upper Zambezi River near Mwande on the Namibian side. 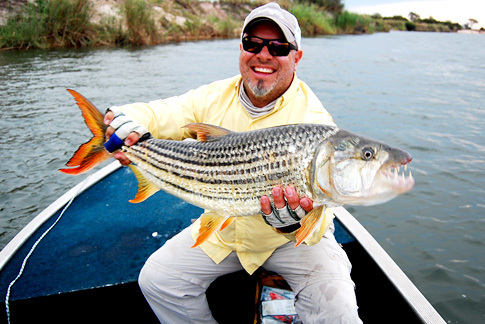 This section of river is famous for big tiger fish and excellent Nembwe and predatory bream fishing. *We can book packages without the flights to Livingstone - Let us know on your email enquiry. drinks & additional items not mentioned in the package. Watch the Shamwari video now! 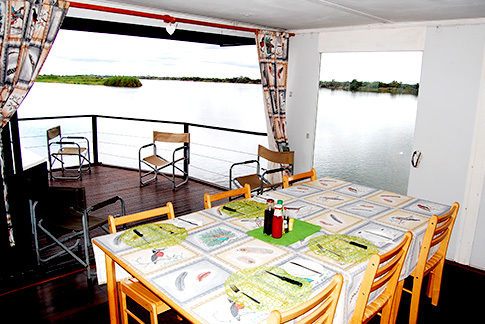 The Shamwari Houseboat is a permanently positioned floating lodge which offers guests the opportunity to fish the Zambezi River from Katima Mulilo to the confluence of the Zambezi and Chobe Rivers 120km downstream. Shamwari sleeps 8 people comfortably in four bedrooms which can accommodate 2 people in each. Each room has large sliding windows which open up to the river. There are two bathrooms which are shared. The main areas of the boat house the dining, lounge area, braai deck and jacuzzi as well has large doors which open up the living space. A laundry service, unlimited ice and DSTV is available to guests. The boat is sold on a sole use basis with a minimum of 4 people with a maximum of 10 people. Guests can expect wholesome and tasty home style meals.. There is no Wi-Fi aboard the boat but there is good cell phone reception in the area if you are on roaming. Experience the thrill of angling for trophy size Tigerfish or the numerous bream species which inhabit this water wonderland at localities such as False Mwandi, Mwandi, Greybanks, Golden Pond and Jo Jo's, names which are synonymous with trophy fish. Shamwari has 3 tender boats with experienced guides for angling. More boats can be arranged on request. Fishing tackle is available for hire. Fly fishermen should bring their own gear.